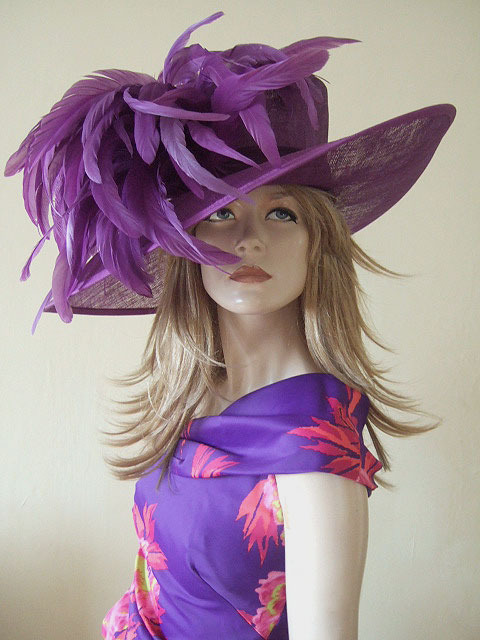 Stunning Large Brimmed Hat with Huge Coque Feathers Plume from Gwyther-Snoxells My Hat. Very striking and attention seeking Purple Hat, with a Large Brim that lifts on one side, dropping the opposite, and with a Huge Plume of Full Cocque Feathers in the same colour. The base of the crown is wrapped in a satin fabric in the same purple tone..
£40.00 per day, plus £60.00 deposit refunded on return. Crown has an Inner Circumference of 22.25". 7.25" wide on the sides, 3.75" Wide at the back, and 5.25" at the front.